POSTED BY: info265 | Sun Apr 19th, 2015 4:51 p.m. The fodder for much of Kriendler’s work is post-consumer waste. 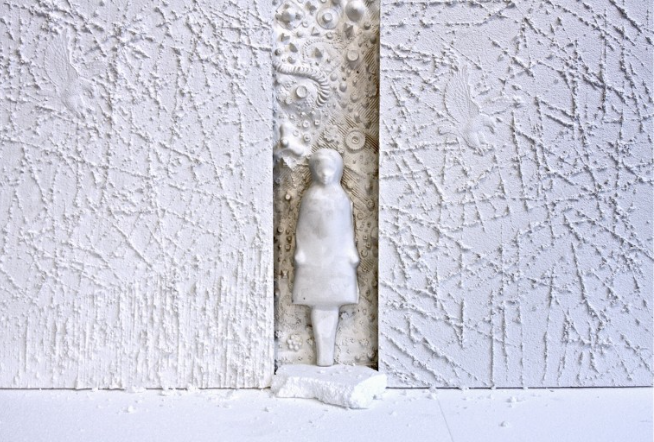 She collects pieces of plastic and Styrofoam packaging and uses them as molds, filling their voids with plaster to translate the negative space into solid form. Kriendler places these plaster casts, many extracted from the packaging of dolls and mannequins, within a series of larger mixed-media sculptures. The Anthropocene, refers to a geological term that is the subject of a heated debate within the scientific community: is the human imprint on this planet large enough to warrant the christening of a new geological epoch – the Anthropocene – an epoch named for us? Special expanded days for the May shows at A.I.R.’s new location in DUMBO will be Tuesday – Sunday, 12–6pm. The gallery will be closed during Memorial Day weekend.